When Meg told me last week that a baked potato bar was opening in Astoria, I got mighty excited. And when I heard that it's from the owner's of Mundo, my enthusiasm grew! Introducing, La Papa in the old Pastalicious space on 30th Avenue. If you're not in the mood for a potato, they also have soups, a jumbo hot dog and Turkish-style paninis. A sweet treat that caught my eye was the Supangle (dark chocolate pudding). 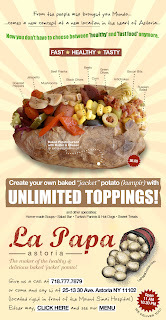 Prices are very affordable with all baked potato options being just $6 (except for the chili con carne, which is $6.50). In fact, nothing on the menu is over $6.50, which is quite the steal. I plan on trying them soon and will let you know my thoughts. I've been to La Papa twice and recently posted the first Yelp review. It's quite pleasing! I went last night and had the veggie papa. Loved it!